this arcane and disinteresting subject is of major importance to your wallet. All marine inboard engines have exhaust risers. The exhaust riser has two functions: (1) to keep water from backing up into the engine through the exhaust piping and, (2) it serves as the device that introduces cooling water into the exhaust exit piping system. If the riser fails to accomplish either of those jobs successfully, the end result is the arrival of Uncle Big Bill on the scene. As someone who has evaluated hundreds of engine damage insurance claims, I can tell you that exhaust riser failures -- either in the design of the thing, or by corrosion failures -- is the single largest cause of engine damage and premature engine failure. Riser problems come in two flavors: Corrosion failures and design failures. If you wish to keep Uncle Big Bill at bay, you need to understand the following points. Corrosion Failures All common gasoline engines use cast iron risers, as do most small auxiliary sail boat engines. Cast iron, of course, corrodes, and is a lousy material to make risers with. Problem is, there isn't anything better. At least not that you're willing to pay for. If you have extra $$$, have them custom machined from titanium and you will solve the problem. That would set you back about $5,000 apiece, so in the meantime we're stuck with cast iron. Actually, for the low cost, cast iron works pretty well. But, like the tires on your car, they do not last indefinitely. Depending on how well they are designed -- for design has an awful lot to do with it -- some last longer than others. Mercruiser, for example, has a wonderful reputation for risers that sometimes don't last a year. On average, in saltwater use, good risers last about 4-5 years. At 4 years, you should start worrying about them. Mercruiser 4.2 V6 riser. Arrow shows where corrosion hole occurred. It doesn't take much corrosion to block these small water passages. Note that the passages top and bottom only have a tiny hole where it met the larger passages on the manifold. Hard to figure this one??? Merc 350 riser. Notice the difference, especially the width of the gasket surfaces between the openings. This one had been cleaned of scale and put back in service. That didn't stop it from leaking and ruining the engine, which it did. Cast iron works well because it tolerates extremes of temperature, expansion and contraction better than other options like stainless steel. Since cooling water is injected into the exhaust heated part, there is usually a zone of very high temperature difference -- a transition zone from superheated to quickly cooled. If you were to heat up a cast iron skillet red hot and then pour cold water in it, you know that that would probably crack the pan apart. Same thing with risers. Ergo, how they are designed has a lot to do with it. The heat transition zones result in more rapid rates of corrosion. Cast iron corrodes in a unique way, depending on type, it corrodes with a sort of sheeting action, or a blistering action, leaving layers of heavy scale on the corroded surfaces. It is not unusual for that scale to become 1/4" thick. When the scale gets that thick, it ends up blocking the water flow. The other problem with this is that this scale stays wet, retains water, a situation which advances the corrosion process. Unlike aluminum or Corten steel, the corrosion does not serve to protect the metal, quite the opposite. Therefore, as cast iron corrodes, the rate of corrosion becomes progressive. Meaning that the rate of corrosion becomes faster. Get the picture here? Right. By the time you see corrosion on the exterior, it's is time to start worrying. It is the thickness of the "jacket," the wall between the exhaust chamber and the cooling water, that determines how long it will last. The thinner it is, the sooner it will fail, but you have no way of know what the thickness is. So you're sort of stuck waiting for the apocalypse. This Crusader 454 riser system is 12 years old. That's because the riser is closed system cooled. Naturally, it costs more money. The water induction elbow is behind the coolant bottle and is a lesser expensive throwaway. Notice the oil filter adapter where you can easily reach it. Crusader riser, salt water cooled. This design uses a steel insert ring with the water passage all around it. It too, is narrow and over time became completely blocked with scale. As with engine blocks, risers have water passages inside that also corrode. Some riser designs, like those of Mercruiser, have passages that are so narrow that the rust scale can quickly block those passages. This causes two problems. (1) it reduces cooling water flow through the whole engine and causes engine overheating, or (2) it can cause the exhaust system to starve for cooling water, overheat, and possibly setting the boat on fire. Neither make for happy days. Even worse though, if corrosion makes a hole between the water jacket and the exhaust chamber, then the cooling water can go down into the exhaust manifold, flood it, into the valves and then the cylinders. This is a very unfortunate state of affairs because it can wreck the engine. You don't want this to happen because it probably is not covered by insurance, meaning you pay. Of course, you cannot see that hole because it's on the inside. One day you go to start your engine and nothing happens. The starter clicks and clunks. Water has seized the engine up. On that day, there will be much wailing and gnashing of teeth. The moral of the story here is that you need to do one of two things. Pay Little Bill to stave off Big Bill. Or wait and pay Big Bill. (1) If you have corrosion appearing anywhere on the riser exterior, it is time to pull them and have them inspected internally. Replace them if Mr. Goodwrench recommends that. Trying to salvage wasted risers is not worth the risk. (2) At the end of 4 years, automatically pull the riser(s) and have them inspected, even if there is no external corrosion. Just because you don't see it on the outside, doesn't mean that the riser may not be about to fail. No, it does not matter how many hours there are on the hour meter. The hour meter measures itself, not the rate of corrosion and is totally irrelevant to anything. Throw them overboard; hit them with a hammer; rig them to a bomb, send it to your mother-in-law; change your oil by them. Whatever. But do not judge the condition of your engines by them. They don't mean anything short of a meaningless number. Aluminum Risers Aluminum is cheap and easy to cast, and therefore cheap in price. Aluminum is the wrong material to use for risers, which is all there is to say on the subject, except that some Yanmar engines have them. Good luck is needed here. Leaking Gaskets The risers bolt to the exhaust manifold, and because the two parts expand and contract at different rates, it's hard to maintain a constant gasket seal. If water is leaking to the outside, it is also leaking to the inside. Count on it. Address the situation IMMEDIATELY. This may not wreck your engine, but salt water under the riser gasket will corrode the gasket surface on the exhaust manifold. A gasket cannot seal to an eroded surface. Once this happens, no gasket will ever seal again and the manifold has to be replaced. If you thought risers were expensive, wait till you see the cost of manifolds. Sail Boats Exhaust systems are more bizarre and haphazard on sail boats than any other kind. That's because sail boat builders don't like engines, so they often don't pay much attention to their installation. it's absolutely critical that the riser system does not allow water going up the exhaust -- or that which the cooling system puts there -- does not get back into the engine. Most systems are okay in terms of height, it's usually other aspects that fail to meet the test of time. The best thing for a sail boat is to use a dry, heavily insulated exhaust riser. That means no water cooling until injecting water on the down side. The problem you see in the photo below is that the water is injected on the UP side. This will eventually make life unpleasant for you. Often combined with water lift mufflers, this can be a problem if the muffler too can fill up with water. Personally, I do not like water lift mufflers because they cause too much back pressure, among other things.There often isn't enough space to install them correctly. If a system is designed right, it doesn't need a muffler as the water in the hose will accomplish all necessary muffling. The system pictured below is rather typical of systems installed by what we might kindly refer to as non experts. If you don't know anything about exhaust systems, it probably looks fine. If you do know, then it is an obvious disaster waiting to happen. I find so many half-baked systems like this in sailboats that it's beyond my ability to summarize in a short essay how to take care of them. If you are in doubt, have an expert look at it. Here's a picture that would make any surveyor's blood run cold. This cast aluminum riser is guaranteed to wreck this engine when it fails, as it inevitably must. In addition, combined with engine vibration, that long lever arm (pipe between aluminum riser and manifold) is bound to break the mount or pipe. The insulation on the down side indicates that the exhaust hose is getting too hot, so they wrapped it with insulation!!! Diesel Engines Most diesel engines no longer have cast iron risers but stainless steel. Didn't I just say stainless was not so good? Yes, but changes in design make it more practical for diesels because people pay more for diesels. Diesel risers are VERY expensive. We are talking Bill's Granddaddy here. Sometimes great, great granddaddy. With turbocharged engines, the exhaust system is different. And so are the risers. One part of the riser system is between the exhaust manifold and the turbocharger. This is normally fresh water cooled and does not figure into our discussion here. There is another component we also call a riser, and that is the part that attaches to the exhaust side, or rear of the turbo. On all Caterpillars since at least 1990, that's going to be a welded stainless elbow. On Detroit Diesels it may be separate elbows on each side, or it may be a single, very large "Y" combination riser/crossover. It doesn't much matter except in price because the function is the same. Both the iron and stainless versions are shown below, along with the obvious reasons why you want the one and not the other. Iron riser for the non turbocharged Cat 3208. Here the very small water passage holes became completely blocked within just a few years. Riser failure here wrecked the engine..
One difference between gas and diesel is that diesel manufacturers do not provide a riser with the engine. Therefore, whatever you get is an after market product, about the quality of which neither you nor I know anything. The good news is that when diesel risers behind a turbocharger fail, the leak isn't likely to go into the engine. The fact is that so many engine manufacturers, boat builders and riser makers got their pants sued off in the 1970's and 1980's for lousy designs that wrecked expensive engines, that they decided to resolve the problem once and for all by designing systems where this wouldn't happen. And so it doesn't, proving once again that it's cheaper to do it right than wrong. Diesel exhaust pipes have to be huge because these engines won't tolerate any back pressure, which will burn up exhaust valves. The riser, which we can also call a water induction elbow, does just that; it injects salt water from the cooling system into the exhaust piping, which is hose or fiberglass, so that the exhaust doesn't burn it up. And because the pipe is very large, a special arrangement has to be made to ensure that the top part of the hose or pipe gets enough cooling water. Otherwise, the fiberglass, rubber or silicone parts will burn up. That's not good, so they put a lot of holes all around the induction section like in the photo below. This causes a spraying action that gets all areas properly cooled. But they are small holes, aren't they? And you know what that means. Small holes normally become big holes, except when they're not supposed to, like in our riser here. Remember the case of the "disappearing water pump impeller blades"? Yes! Now you know where all those broken pieces of water pump impeller blades end up. They go completely through the system and stop right here at our risers to make our lives somewhat less than totally pleasant, and our bank accounts a little emptier. Yep, lodged right against our little holes there, very nicely blocking off the water flow right where you need it most. Naturally, this creates the same problem as with a gas engine, reducing cooling water flow and increasing tendency to over heat. So what we do about this then, is to take out our gun and shoot the damn thing. Angry as hell and not going to take it anymore. Take that! You miserable chunk of stainless! An infrared thermometer gun, that is. This allows us to "scan" the system and find hotspots that will tell us where the blockage is. Actually, you can even feel around the exhaust hose (especially at idle) and if there are spots that burn your hands, you've located the problem because the hose should not be that hot. Consequently, the moral of the story here is that even diesel systems need to be checked out occasionally, just like we know we should do preventative maintenance on our car radiator but never do, waiting for it to crap out at the worst possible moment. But car radiators cost hundreds, while we're talking thousands here, folks. A little Priority Management 101a.02b7, section DXDCIIV, Title III is in order here. Under the heading. A stitch in time saves nine. If the system is not designed right, then it is possible for water to at least get into the turbo. This is one of the most common causes of turbo charger failures. You replace a $2000 turbo, not knowing why it failed, only to have it happen again because the riser is the culprit. This can happen when the elbow is at a horizontal angle, so that the water can run forward instead of only aft. Bearing in mind that a little change in trim of the boat can help the leaking water along here in positively the wrong direction. Notice that the stainless riser in the photo above is angled downward somewhat. Even if it did leak, the water would run away from the turbo, so this set up is a good one. Very good. Not all diesel mechanics are marine mechanics. Many, especially those employed by engine dealerships, are truck and heavy equipment mechanics with little or no marine experience. I have found that many do not understand the effects of saltwater on these engines, and have made costly diagnostic mistakes regarding exhaust systems. It is best to employ a marine specialist if you can find one, but they are not universally available as they are in major boating centers. Large diesel induction elbow. This one is 5 feet long. In this photo, the top of the pipe is at 2 o'clock, the bottom at 8 o'clock where all the rust stains are. There should not be any rust stains on the inside, which means that there are leaks. These leaks all came from weld joints, all of which were repaired and this riser was put back in service. Leaks Stainless exhaust system parts are welded, and welds are weak parts as far as corrosion goes. And many of them are only welded from the outside because it's hard to weld on the inside of a pipe. 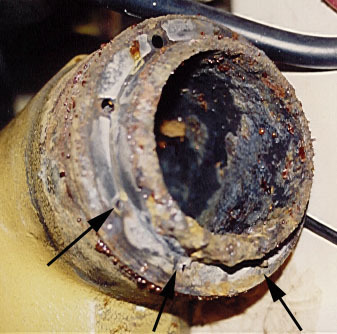 Ergo, leaks usually occur at weld joints. One very good thing about stainless is that it does not generally corrode, but rather pits in unexplainable random places. Meaning that there can be a little hole smack in the middle of a bunch of nice clean steel for no apparent reason. You don't need to know why this happens, only that it does. The really nice part is that Mr. Goodwrench can take that part off, back to his shop, and just weld that little old hole up. Presto! And put it back on. That part may last indefinitely. You like it and I like it. Neither of us like it when the experts make big mistakes. Like attaching a carbon rubber hose to a stainless riser. Carbon rubber and stainless are like cats and dogs; they do not get along, and the rubber always wins. That rubber will eat the stainless right up, and it will leak like crazy. At the point where the hose attaches to the riser, another thing happens, and it's not good either. it's called crevice corrosion. In the simplest of all possible terms, water gets between the hose and the metal and corrodes it because of a lack of oxygen. Don't matter how or why, just know that it does. So, if you see leaks occurring at the point where the hose attaches to the elbow, it is best to get those leaks stopped right away. Because, if you don't, you can be sure that like Paul Revere riding through the night, Big Bill is a comin'. If you wait until the little leak becomes a waterfall, then you'll be facing the replacement of an $1,800 elbow (plus labor) times however many are going bad. Plus whatever that leaking saltwater leaked onto and damaged. Like that $800 engine starting motor. Save your britches and take those stitches. Epilogue Leaks on engines are nothing to fool around with. They are trying to tell you that something is wrong, and you ignore them at your own peril. This is part and parcel of why boat ownership is so dang expensive: they float in saltwater which is horribly corrosive. While we can marvel at how fish thrive in this stuff, and relish eating them, we pay a high price to travel where they do. But it's a whole lot cheaper to nip these problems in the bud, rather than letting them grow shark's teeth. David Pascoe is a second generation marine surveyor in his family who began his surveying career at age 16 as an apprentice in 1965 as the era of wooden boats was drawing to a close. 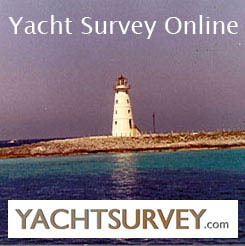 Certified by the National Association of Marine Surveyors in 1972, he has conducted over 5,000 pre purchase surveys in addition to having conducted hundreds of boating accident investigations, including fires, sinkings, hull failures and machinery failure analysis. In addition to readers in the United States, boaters and boat industry professionals worldwide from nearly 80 countries have purchased David Pascoe's books, since introduction of his first book in 2001. In 2012, David Pascoe has retired from marine surveying business at age 65. On November 23rd, 2018, David Pascoe has passed away at age 71. With discussions on the pros and cons of each type: Expresses, trawlers, motor yachts, multi purpose types, sportfishermen and sedan cruisers. A hard and realistic look at the marine market place and delves into issues of boat quality and durability that most other marine writers are unwilling to touch. The Art of Pre-Purchase Survey The very first of its kind, this book provides the essentials that every novice needs to know, as well as a wealth of esoteric details. Pleasure crafts investigations to court testimony The first and only book of its kind on the subject of investigating pleasure craft casualties and other issues. for multiple books purchase directly from us. See Details. Boat Types: Which is Right for You? Last reviewed September 25, 2016. Articles, Images: Copyright © 1997 - 2018 David H. Pascoe All rights reserved. Web site design & developement: Copyright © 1997 - 2019 Junko A. Pascoe All rights reserved.